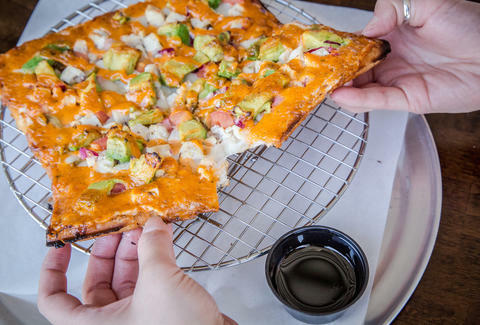 The inventor of waffle pizza is an unsurprisingly young guy -- James “Konfidential” Kim (the nickname is from his days beatboxing -- seriously), who’s obsessed with eating breakfast for dinner, and is hoping you are too. 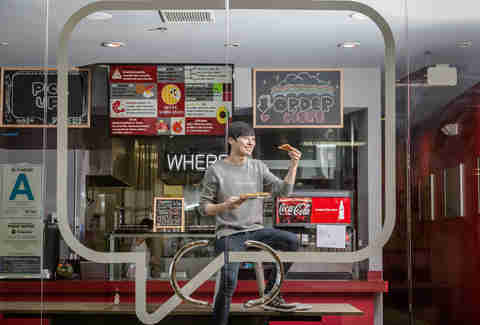 Oddly, his idea came from eating normal pizza on the streets of NY -- and a stint waiting tables at Genwa, the sorta-schmancy KBBQ spot in Beverly Hills. 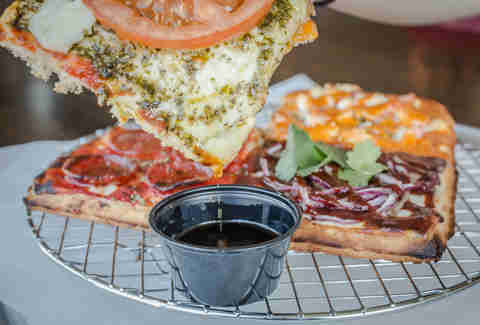 He was living at home with his mother when she dropped what would become a business truth-bomb on him: “You love waffles and pizza,” she said, in a kind of thrown-off-idea that makes you wonder WHY THE HELL NO ONE HAD THOUGHT OF IT BEFORE. Kim worked hard on his dough recipe, which is based in wheat flour but cut with rice flour to give it a less-doughy finish; the result is flaky and crispy, like a waffle minus the sweetness -- imagine a thin-crust pizza made of waffle dough and you’ve got a bit more of an idea of what’s up. So yeah, what you'll eat: these monsters, cut in four pieces, each come with pure maple syrup and are topped with both traditional pizza ingredients (there’s a pepperoni option with... you can guess) and more strange-arrangement gems (a shrimp and garlic option; a Korean pizza-waffle with bulgogi, corn, and grilled kimchi). You can also get combos with different options on each of the four slices if you just can’t decide on one. 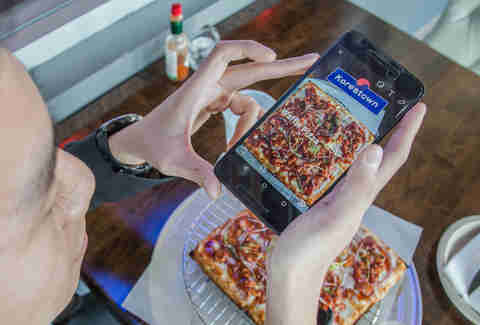 Is this the beginning of a true food trend, or just a flash-in-the-pan for Instagram likes? Our take is that they’re, yep, actually delicious -- but they probably won’t hurt your follower count, either. Dustin Downing is an LA writer and photographer who can be found online at DustinDowning.com.